1 : a person who puts on a false appearance of virtue or religion. 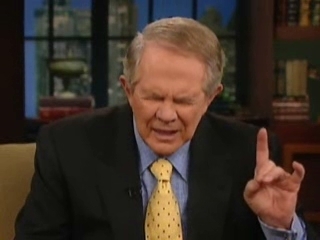 Pat Robertson has proven to me what I have often suspected that he is, a hypocrite. He made a statement that it is okay to divorce a spouse because of Alzheimer’s disease. Tuesday this week he said; “I know it sounds cruel, but if he’s going to do something, he should divorce her and start all over again, but to make sure she has custodial care and somebody looking after her.” He stated further, "I certainly wouldn't put a guilt trip on you ... I can't fault him for wanting some kind of companionship, and if he sense in a sense, she's gone, he's right It's like a walking death. Get some ethicist besides me to give you the answer. I recognize the dilemma and the last thing I'd do is condemn you for taking that kind of action." First of all Mr. Robertson, she is NOT gone until she is dead. Marriage vows are not until you are in a like death state, they go on till the death of one of the marriage partners. They are “from this day forward, for better, for worse, for richer, for poorer, in sickness and in health, until death do us part.” Have you not been to a wedding and listened to this? Okay all of that aside, you have claimed to be a minister for years and years, and for some reason or another, people listen to you. You have proclaimed and in essence condoned something that is not what you have preached, and therefore you are a false prophet. You need to retire or maybe go into seclusion before you do more damage than you are worth. You have elevated yourself UP to crackpot evangelism much like your contemporary Harold Camping. In my humble opinion, one should be faithful to ones vows and covenants. In my opinion, marriage is one of the most holy of these, and should not be cast aside, because she seems like she is “gone” and is a hardship. What would Jesus do? Would he abandon the cause because it was too much for him? No, he suffered pain that caused him, the greatest of all, to tremble because of pain, and to bleed at every pore, and to suffer both body and spirit, and would that He might not drink the bitter cup. Nevertheless, glory be to the Father, He partook of the cup and finished his preparations to the children of men, even you Pat. He did not back down when it became too hard, and he endured his suffering to the end. Maybe we should take his example. Now to the “gone” statement; if the lack of evidence of intellect is your indicator that they are gone, then when does life end? You have been telling people that life begins at conception, and have said how evil it is to end it. Well, now by your definition, it is only when the person can be a contributor to a relationship. What about those fetuses? They are then gone by that definition. Retarded children, autistic children, they fall under this loophole that you have now provided. Shall we abort or abandon them too??? What about crackpot preachers?